What do you drink when it's a billion degrees??? | eat. live. travel. write. What do you drink when it’s a billion degrees??? If these don’t float your boat, how about some “energy drinks”?? And yes, that one was as gross as it looked. Or how about just drinking multiple fruit shakes a day??? How was that, then Neil??? 7 Responses to What do you drink when it’s a billion degrees??? 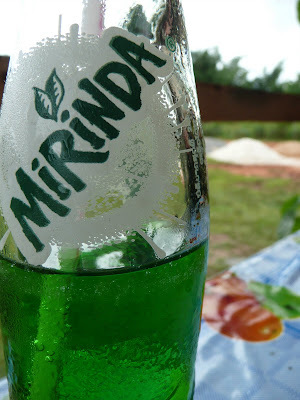 We loved the green mirinda and are missing the flavour now that we are back in OZ. Hey guys – I can't see a green drink without thinking of you two!!! You'll surely think I'm crazy, I drink gazpacho! Love the fact that you gave a mention to M-150, Devotion. Courage. Sacrifice. Lai duh! The Beer Lao Dark was better, but same price for small (i.e. regular, not 700mL) bottle. As for lao lao, I actually enjoyed it. Firewater indeed – even warm fresh from the still. The mojitos was splendid, but the "lao and tonic" not so much. You might say I have a drinking problem, but after reading your post Mardi, it's made me that thirsty, I could go one of those Beer Lao's right now and it's only 7 o'clock in the morning. Thank goodness the commuter trains don't have refreshment cars or I might just spend the day in there instead of going to the office. Leave a Reply to Neil C. Phillips Click here to cancel reply.